New! This topic has gained enough attention that misinformation is now being spread. To address this attempt to confuse the public, a new book has been released. It is available for pre-order on Amazon.com. Only $8.97 as of January 10th, 2008. 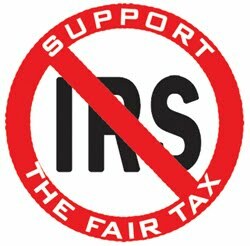 Rich or poor I think the fair tax is what this country needs. I realize how complicated changing to it would be. The current tax code with all of its credits, penalties, forms, Schedules, Publications, documentation requirements, and reporting of personal information needs to GO Away. [If you meet qualifications A,B,C and made between $x and $y then you can take a credit of $z, Unless your AGI is over $h ]would be replaced with "If you buy item X for $y, you pay y* 23% in tax." Yes this is charged on all food, medical care, etc. What you don't realize is that you currently pay federal taxes on those items already. Now while really high medical bills may result in tax credit under the old system...most of the income you paid for medical care was not tax deductible. And the income taxes paid by the Dr.'s office or hospital ended up in your bill anyways. Same with food. Taxes on your income did not deduct the money you paid on food. Once the hospitals, Dr. offices, and grocers stop owing business income taxes the price of goods and services will adjust accordingly. Some argue "What is to keep businesses from just keeping current prices with the added tax?" The same thing that keeps them from charging more right now.. the market. This is tax reform..not government reform. It simply makes the tax levied more fair. The congress can still raise rates too high and other undesired actions. No plan is perfect..but Fairtax is much better than current system. The congress could find some reason in the future to bring back the income tax on top of the national sales tax. If they did it would be your fault for voting for such politicians. It is not a flaw of the fair tax, it would be a flaw of leadership. The one major inequity that I think still needs to be addressed is: Those who have paid their taxes, and saved money and assets would pay sales taxes when they spend that saved income. In order to exempt that money, the mother of all tax returns would need to be filed and documented, and a huge prebate given in lump or over time. Hopefully a fair way can be determined for this exception.